Invisible Fence® Power Caps™ (the specialized batteries for Invisible Fence® collars) are expensive. If you use an Invisible Fence®, you have probably found yourself shocked when your local dealer gives you an average price of $21 to $30 for a battery. Until now you've had no choice but to pay the exorbitant price or risk your dog’s safety. Now you can get a battery cap that performs just as well and saves you money! We know that batteries are expensive and that's why Flexpetz is proud to offer special pricing on quantity orders. We're so confident that our Power Cap compatible batteries will work perfectly for you, we offer a 100% money back guarantee. If you are unhappy with your Invisible Fence® compatible battery cap purchase, contact us for a full refund including shipping back to us. With the components that make up this battery, it gives the power to last longer and have better safety factors then the normal battery. 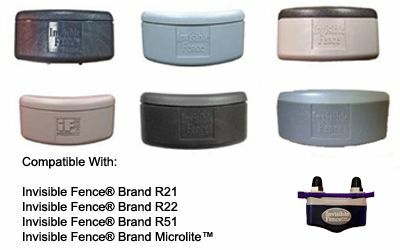 Note that although colors may vary among Invisible Fence® brand receivers, eXtreme Dog Fence™ EDF-0200 battery is 100% guaranteed to work with all listed receivers. Fantastic. The eXtreme brand Invisible Fence compatible battery is top notch. This eXtreme battery is actually pretty impressive. The cost is low and the lifespan is nice and respectable. The previous batteries we would get were okay, but they seemed chincy. This battery is a perfect fit, and a perfect price tag. Anyone who has an Invisible Fence system can surely benefit from the purchase of the eXtreme brand battery. The Invisible Fence brand batteries are twice the price and didn't seem to last as long. Switched to this brand about 6 months ago and they work great with my collar. Buying my 3rd battery already but wont need it for about a month. Great product and cannot believe that it is half the price. Great battery. Great manufacturer. Great online pet supplies store. A+ review. If you need to replace a battery in one of the Invisible Fence brand shock fence collars, you may be interested in the performance of the extreme Invisible Fence batteries. You would think that they are a sub-par product, because they cost about 1/2 as much as the batteries do that you purchase directly from Invisible Fence company. The only problem we've had with the extreme batteries is that we made the mistake of trying to replace the battery outdoors. Well, we dropped one of them and it rolled into a drainage grate. Lost that one. ha ha. We ordered another one from Flexpetz and it arrived in 2 days. We were very happy. High praise and recommendation for the exreme battery. Very good product. This collar battery is great and is very inexpensive. I like these batteries are sold in large packs. Buying the packs allows me to save money and have an ample amount of batteries for my dog's collar. I found other similar batteries online. There is a major price difference. I am saving money with these batteries and I appreciate FlexPetz's amazing pricing. Thank you. You have a happy customer for the long run. The Extreme battery for Invisible Fence collars is superb, and half the price. I went forward and purchased one of the Extreme brand batteries, for the Invisible Fence collars, on my last visit to flexpetz.com. We had been using the Perimeter Technologies brand compatible battery, previously, but wanted to give the new battery a fair shake. Needless to say, I was very pleased with the amount of life on that battery, the low price tag, and the track record I've had purchasing through this site. The staff at Flexpetz is very helpful, and know what they are talking about. Mike was very personable and helped us with the purchase. I'll definitely be continuing my pet supply shopping with them. I would definitely recommend that anyone with Invisible Fence brand collars should give the Extreme batteries a try. I'm confident they would not be disappointed. Great alternative for a battery. Good thing I decided to save myself some money and shop around. Needed a replacement battery for my collar and stumbled in to this one. Read some of the great reviews about this and decide to try it. This is my second time purchasing one of these batteries and am going to continue to do so. I decided to write a review to let others know that these batteries are great. They have surpassed my expectations. The real bonus is how much these batteries save me money. They are long lasting and ensure my dogs are secure. I normally buy the larger packs and keep them handy for use later on in the months ahead. If you are looking for compatible collar batteries for your Invisible Fence compatible collar these are great. Extreme value at half the cost. These Invisible Fence compatible collar batteries are a very good choice. This Extreme battery is a well made battery. It fits in the Invisible Fence collar and doesn't stick out a little bit, like the Perimeter brand version of this battery does. It does last quite a while, but the biggest factor for us was the cost. These batteries are about half what you'd pay Invisible Fence for one of their own batteries. The reviews that I've read on these batteries are all positive, and I'm now going to be part of that statistic. I'm very happy with my last two and will continue to restock with these batteries until they cease to make them, or a better solution comes along. These batteries are a steal! This eXtreme brand battery works almost too well compared to the other products like it. I have a lovely pitbull named Halo, he can be a little stubborn and I think he enjoys the beeping of his Invisible Fence collar. He is a great dog but the batteries he consumes was getting ridiculous. Great value on this great product. Thanks everyone at FlexPetz for the help on finding these batteries. We both love this product! Halo and I will remain happy customers. I'm proud to leave my review of approval for the eXtreme brand, Invisible Fence compatible battery. We ordered a battery for the Invisible Fence brand fence collar, and somewhere during the delivery, -the package got smashed and the battery was damaged. The lady I spoke to, at Flexpetz, sent out a replacement and I didn't even have to wait. The battery arrived 2 days after being sent out, and it was in perfect condition. It's the second eXtreme brand battery we decided to purchase. The first one we got was a pleasant surprise. We got more than 7 months of life out of it. We decided that we would stick with this brand for a while, and see if all the eXtreme batteries are as impressive as the first. Flexpetz's support is excellent and the battery is as well. We're on board and will remain customers for as long as Flexpetz and the eXtreme batteries are still around. The batteries help save a ton of money. I think this site is fantastic for carrying batteries for the invisible dog fence collars. The prices of these batteries are priced fairly and allows people to save money. I have been using these batteries for over a year and always buy the larger packs for my 3 boxers. When I discovered them I knew I found a great deal. Another great attribute is the batteries last almost 2 months longer than the batteries I used in the past. I love these batteries. Thank you FlexPetz. About to purchase a larger amount of these batteries. I wanted to test one out first so I just ordered one. Now that I am sure of the products quality, I am going for the bigger better cost. Saves me a ton of money in the long run and they fit so much better then the perimeter brand ones. I was hoping this would turn out good, it has been a long road of spending money on the Invisible fence batteries. Highly recommended from my experience! This battery is a great replacement battery for the Invisible Fence collar. I only have good things to report on my first Extreme brand battery. It was a perfect fit for the Invisible Fence collar it was purchased for. It lasts a good 2 months longer than the other battery I used to buy. I'm not sure what the difference is that makes it last longer. I'm not a technical lady, but this battery is worth every penny spent. I would offer anyone my recommendation on giving this battery brand a try. The effort won't be wasted. Yay for a quality replacement battery that's compatible with Invisible Fence collars. I could easily regurgitate the content of previous reviews on this Extreme brand battery, because I can now see what the hubub is all about. With my first one, I expected it to work well and compete with the other brands of Invisible Fence compatible batteries, but the Extreme really does take the cake. As already stated, they are well made. I also noticed that something was loose in the Perimeter version, whenever I would shake it. No such shoddy craftsmanship in the Extreme brand. Also, the first one lasted more than 2 months longer than the Perimeter did under the same circumstances. There is definitely something to be said for exploring change. If you don't take the chance now and then, you'll never find the little gems in life. I too would give my recommendation on the Extreme battery, to anyone with an Invisible Fence. A+ all the way. Very nice battery guys. Looks like all your reviews are legit. eXtreme is a truly good brand. Having an invisible fence with 4 rowdy dogs keeps batteries cycling with the system. I'd mostly been working with the Perimeter Technologies brand, and never really had much complaint. I don't think I will ever buy another Perimeter brand Invisible Fence compatible battery (unless eXtreme goes out of business for some reason). These batteries really do last and seem to be well designed. I won't ramble on, singing the praises, but will agree with the other reviews on this battery. I'm pleased and will continue buying the eXtreme battery whenever I need a replacement. Not a bad battery. Other aftermarket batteries I have bought did not fit securely. The Extreme battery fit as well as the Invisible Fence battery and the cost is much better. I have been using this new battery for about 2 months and still going strong. So far so good. I will be ordering the multi-pack for even more saving. I have been buying these replacement batteries from Invisible Fence for years. I could not be happier that someone created a compatible battery that works with my Invisible Fence collars. I was spending over $300 per year to keep batteries in 4 collars when I was buying directly from Invisible Fence. I willing to try anything to cut my battery costs. The life in the Extreme compatible batteries has been outstanding. I have been using them for almost 4 months they are still working. Even better...my annual battery expense will drop to <$99. I bought a 15 pack because the lithium-ion batteries have a 5 years shelf life. Hugh savings and equal quality. That's not common. The eXtreme brand battery, for use with the Invisible Fence collars is a good value and reliable product. They are inexpensive and have a good life span. I knew it would be, because it's by the same company that makes the good dog fence wire. I would recommend anyone with an Invisible Fence give them a try. I don't believe anyone will be disappointed, unless I just happened to have the one battery in the bunch that had excellent performance. I give this product my consumer thumbs up. I hate the Invisible Fence Guys, their a rip off! If I could go back in time when they actually seemed to give a damn when they were selling me the damn thing I would seriously give them a piece of my mind. Now that I am a customer and they have me on their leash, I get treated like trash and all they care about is there damn money and how to scam me even more. I started researching and found this site. Although I am very weary about sales guys more then ever now when it comes to this stuff I decided to try out there battery. There battery worked just like I had hoped. I have been researching on this site and have technically wasted some of the sales guys time to see if they mean business and not just some gold diggers. I am looking to purchase a replacement system from them so I have no need to call invisible fence anymore. I want to make sure that the guys on the other end can be trusted to be available and not charge me any more then they need to for parts. So far they have been supportive and I have only purchased one battery. I have to give it to them that they have some patience, I have called them about purchases I am thinking about and they have worked with me on helping me out even through I have not purchased anything except for this battery. Anyway, point of review, I am happy so far as a flexpetz customer and I like the customer service so far, but as for invisible fence... well they can stick it! I don't know if you just get a lower grade of battery when you get an Invisible Fence brand fence, but the best thing you can do is give these extreme batteries a go. They last a significantly longer amount of time and are are less expensive than the Perimeter version of these IF compatible batteries. Until something figures out how to top these batteries, I'm getting extreme batteries anytime I need a battery for an Invisible Fence brand collar.